Stocks rallied on Friday, but they remained within their week-long consolidation. Which direction is next? Will bulls drive prices higher this week? Or will Friday's move up fade today? The S&P 500 index continues to trade along the level of 2,700-2,750, and it is still around 4.4% below its late January all-time high. Stocks are expected to open higher today, but will they continue upwards after 9:30 a.m.? The main U.S. stock market indexes went 1.4-1.8% higher in Friday's trading session, as investors' sentiment improved following week-long fluctuations after previous week's rally off February 9 lows. The S&P 500 index got close to its recent local highs and it currently trades around 4.4% below January 26 record high of 2,872.87. It retraced more than 61.8% of its late January - early February sell-off (retracement level at 2,742.92). The Dow Jones Industrial Average gained 1.4%, and the technology Nasdaq Composite gained 1.8% on Friday. 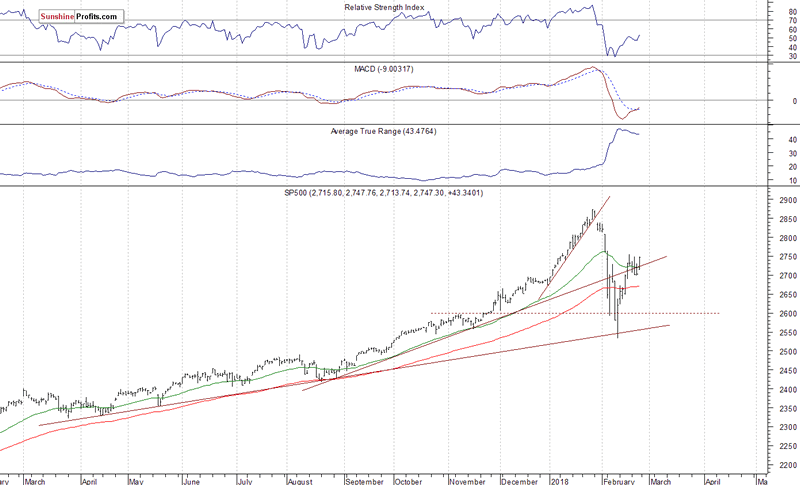 The nearest important level of resistance of the S&P 500 index remains at around 2,750, marked by recent local highs. The resistance level is also at 2,760-2,765. On the other hand, support level is at 2,700, marked by local lows. If the market continues higher, potential resistance level would be at around 2,800-2,810, marked by the late January short-term consolidation. The index futures contracts gain 0.3-0.6% vs. their Friday's closing prices this morning. It means that investors' expectations ahead of the opening of trading session are positive again. The European stock market indexes have gained 0.3-0.5% so far. Investors will wait for the New Home Sales number release at 10:00 a.m. Will the market continue higher after the opening of cash market's trading session? The S&P 500 index is expected to break above its week-long consolidation today, unless sentiment worsens before 9:30 a.m. The Dow Jones Industrial Average daily chart shows that blue-chip index reversed its uptrend a month ago. The price broke below the level of 26,000 and continued much lower. There were some medium-term negative technical divergences - the most common divergences are between asset’s price and some indicator based on it (for instance the index and RSI based on the index). 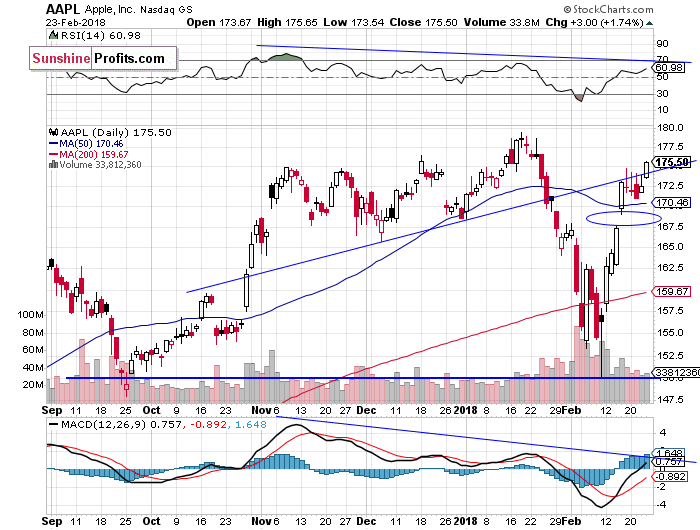 In this case, the divergence occurs when price forms a higher high and the indicator forms a lower high. 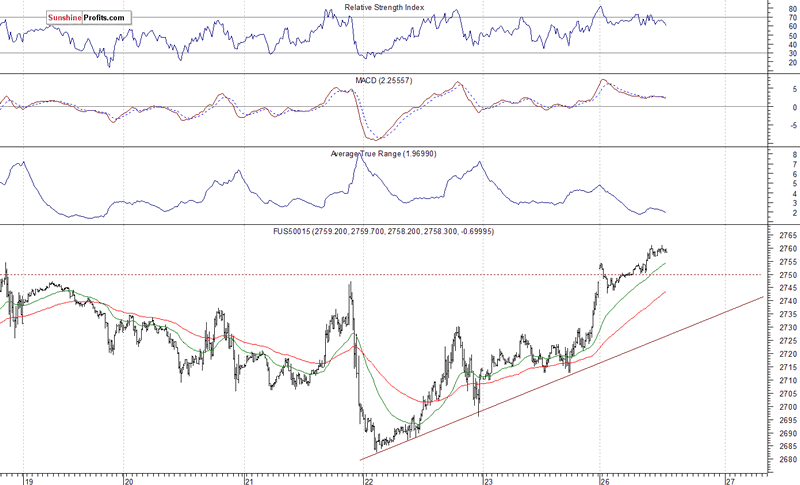 It shows us that even though price reaches new highs, the fuel for the uptrend starts running low. Concluding, the S&P 500 index rallied 1.6% on Friday, as it got closer to recent local highs again. The broad stock market is expected to continue higher today, unless investors' sentiment worsens before the opening of the cash market's trading session. Investors took some short-term profits off the table last week, but they resumed buying stocks on Friday. The market is still more than 4% below month-long record high, so it didn't retrace all of its late January - early February sell-off. Will it come back to record high? It is hard to say, but we can see some bullish pressure, as investors' sentiment improves following economic data, quarterly earnings releases. Stocks are expected to open higher today, but we may see short-term profit taking at some point. 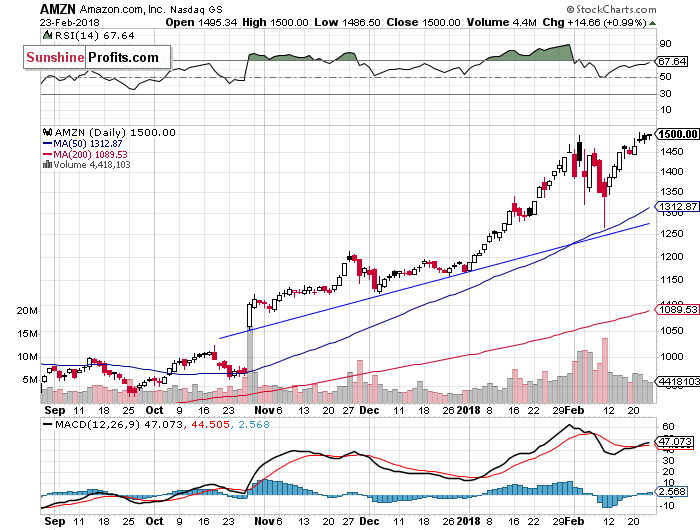 The broad stock market was falling almost 12% off its late January record high on Friday, February 9 before an intraday reversal. 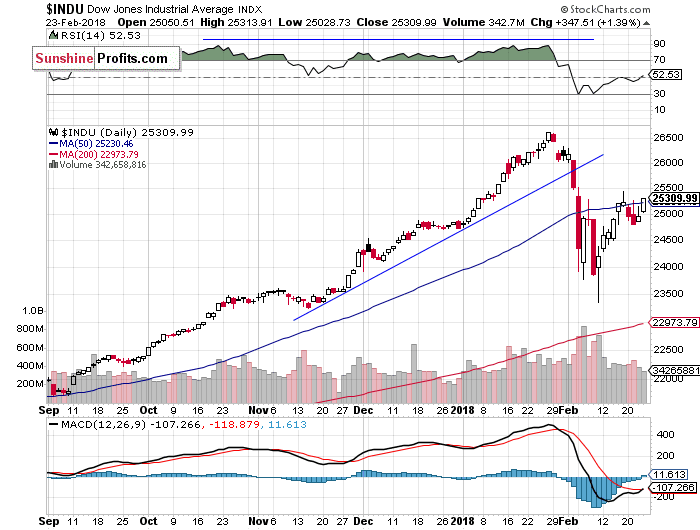 It was a final panic selling ahead of short-term upward reversal, and the market found a support of its medium-term upward trend line, which was at 2,550. The index extended its week-long rebound almost a week ago on Friday, and it continued slightly above 61.8% retracement of the sell-off. The S&P 500 index retraced its whole month-long January rally and fell the lowest since early October. Then it retraced more than 61.8% of this relatively quick and deep sell-off. 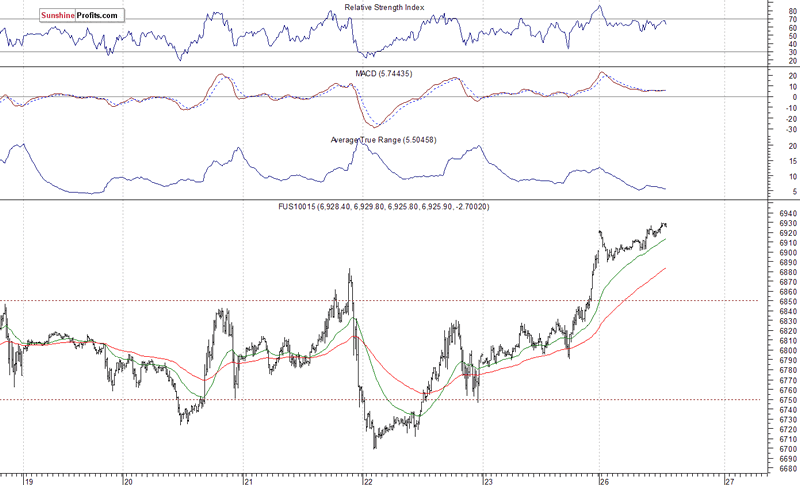 So, medium-term picture is now slightly bearish. Investors took profits off the table following the unprecedented month-long rally, but then they began selling in panic. It was quite similar to 2010 Flash Crash event. Is this just downward correction or the beginning of a new medium-term downtrend? This sell-off set the negative tone for weeks or months to come, despite recent broad stock market rebound.